The scamp, or ‘Sketched Creative Accurate Marker Picture’ to give it it’s full name* has been the first incarnation of many an idea since the dawn of advertising. However, recently this simple, cheap and effective method of presentation has increasingly been abandoned in favour of going straight to Mac. Why? Good question. Scamps are a friend of the idea. Best friends in fact. They help create more original ideas, facilitate the generation of multiple ideas and also help Account Teams and clients alike focus on the idea. As our robot overlords march us towards more and more technological automation, the idea of an idea in marketing and advertising communications has been lost and the innocent scamp has shared its demise. But if we can bring back the scamp maybe we can drag the idea back from the brink too? So what are the benefits of the humble black and white marker sketch versus the pixel perfection of a Mac visual? That means a client viewing a scamp isn’t distracted by the exact size and position of their logo or the pantone reference of their particular shade of blue and instead focus on what’s important. The idea. The simple partnership of headline and image that is unique to that particular pack or email or poster as opposed to the brand, which is the same on everything yet still seems to gain more attention. With a few exceptions such as multiple frames on banners, scamps are much quicker to produce than Mac visuals. If a client is only going to see a couple of Mac visual ideas, one had better be the right one. Scamps means we can show many more ideas, including those that are more leftfield and push the boundaries of their comfort zone. No matter what, our clients appreciate having a choice. The main advantage of the scamp in terms of creativity is you are only limited by your imagination, and what you are able to draw. If your idea is to have an image of a cowboy riding a unicorn (see what we did there) then you have to source an image of that on a stock library. If there isn’t one you either have to try and Photoshop a horn on a horse or commission a shoot or illustration at great expense. All for an idea the client hasn’t seen yet and might not buy. Long live the idea! 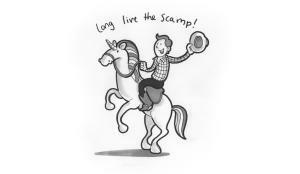 Long live the scamp!